The smell of Etouffee, be it Crawfish (my Crawfish Etouffee Recipe) or Shrimp, is one of the most heavenly aromas that I know, along with the smell of Shrimp a la Creole. The word Etouffee (Ay-2-FAY) translates roughly to smothered , stewed, or braised. To me it simply translates to happy taste buds. Shrimp Etouffee is always my favorite to cook for family and friends. I always buy shell on shrimp, why? For the same reason I buy bone in cuts of meat. Stock. The amount of shrimp you’re using for this recipe will produce just enough Shrimp Stock, plus a little extra (recipe below). 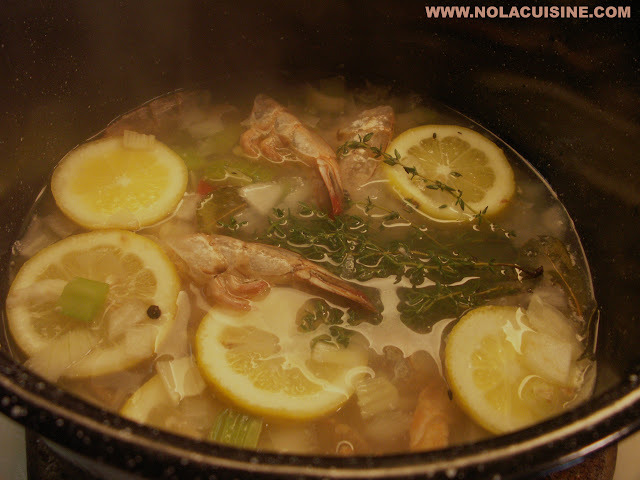 Shrimp stock only needs to cook for about 45 minutes to 1 hour. Add all ingredients to a 2 qt. saucepan. Cover this with cold water, it should be about 6-8 Cups Cups. You’ll need 1 1/2 Cups for the Etouffee. Bring almost to a boil, reduce the heat to a low simmer. Simmer for about 45 minutes to an hour. Strain. Tip: When adding fresh Thyme to a simmered dish like this, I always bundle the Thyme tightly with butchers twine. The leaves will remove themselves while cooking, and you will get all of the flavor from the stems. When ready to serve just remove the bundle of stems along with your bay leaves. Season the shrimp with 1 Tbsp of the Creole Seasoning. Melt the butter in a large cast iron skillet, add the onions, bell pepper, and celery, saute until translucent. Whisk in the flour to make a blonde roux, stirring constantly, about 3-5 minutes. Stir in the remaining Creole Seasoning. Add a small amount of the shrimp stock, stir well to form a paste, add the remaining stock gradually, whisking constantly. Bring to a boil, then reduce to a simmer. You may need a little more stock, but the end result should be the consistency of a gravy, not too thick, not too thin. Add the tomatoes, garlic, Thyme, Worcestershire, and hot sauce, a little salt, black pepper, and Cayenne. Simmer for 20-30 minutes. Add the shrimp, green onions, and parsley, simmer for 10 minutes more or until the shrimp are cooked through. Stir in the 3 Tbsp butter, and adjust the seasonings to taste. Be sure and check out my ever growing Index of Creole & Cajun Recipes, which links to all of the recipes featured on this site!